Product Consists : Premium Skin Cottage shower gel lavender Fragrance (Weight : 400 ml), Premium Skin Cottage hand soap lavender and Chamomile extracts (Weight : 500 ml), Holi pichkari, 3 Containers of Non toxic herbal scented holi colors (Weight : 50 Gms Each), One Container of Balloons along with Small bucket. Holi is the time to develop understanding and love for each other. Giftacrossindia is a best platform for helping our customers to maintain religious belief also it helps to renew your friendship and relationship and to express heartiest love by scribbling a beautiful Holi message with Premium Skin Cottage Care Complete Holi Gift Set for Female items home delivery for your loved ones. Traditionally the colors used in Holi came from herbal scented ingredient. Use natural, skin friendly products at this holi with this grooming hamper. This combo is presented as gift to any one like to your Staff colleague, Best Friend and to many more. Fill the special day of your loved ones with lots of sweetness and brightness. Surprise them with this beautiful holi gift hamper. Browse your favorite products, it is very conveniently available for online shopping from anywhere in India with Free Shipping. 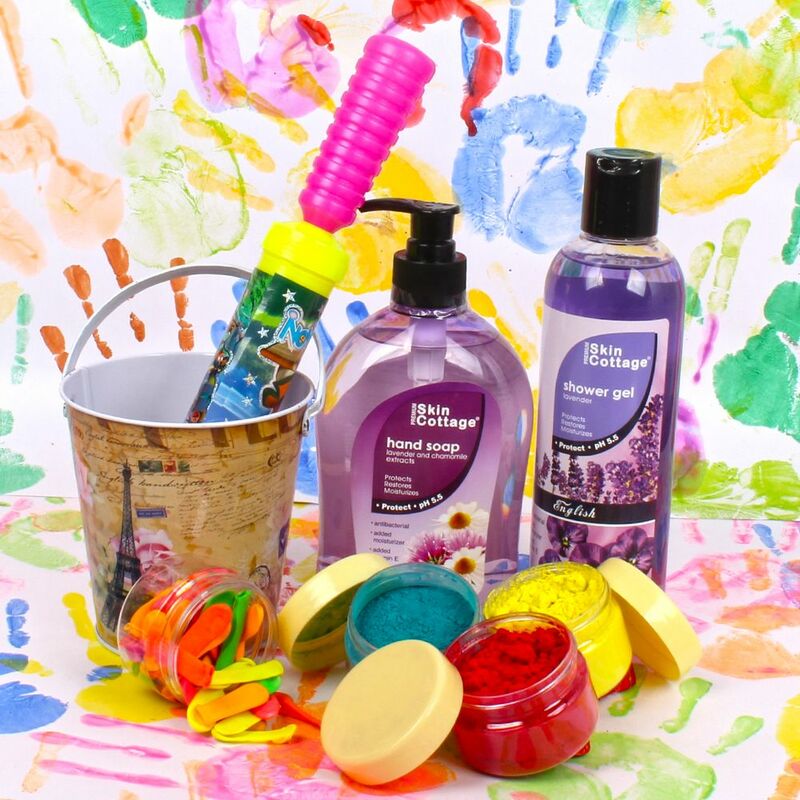 Product Includes : Premium Skin Cottage shower gel lavender Fragrance (Weight : 400 ml), Premium Skin Cottage hand soap lavender and Chamomile extracts (Weight : 500 ml), Holi pichkari, 3 Containers of Non toxic herbal scented holi colors (Weight : 50 Gms Each), One Container of Balloons along with Small bucket.